INDIANAPOLIS, IN (October 19, 2018) — Danielle Combs of Crane Credit Union (CU) in Odon is a recipient of the 2018 Emerging Leadership Award from the Indiana Credit Union League. Combs has been with Crane CU since 2013, starting in the eCommerce Department. She moved to cards where she was instrumental in converting the credit union’s debit and credit card programs to PSCU. After that she was assigned to risk management, a program she has built from the ground up. Most notable is Horton’s dedication to emerging leaders in her own organization. She was one of the founders of the credit union’s LEAD program, which stands for Leadership, Education, and Development. Employees apply to participate for one-year terms, and the program consists of monthly meetings, speakers and outings during that time. Recently, the LEAD group has done beautification and landscaping in Loogootee, one of the credit union’s branch communities. 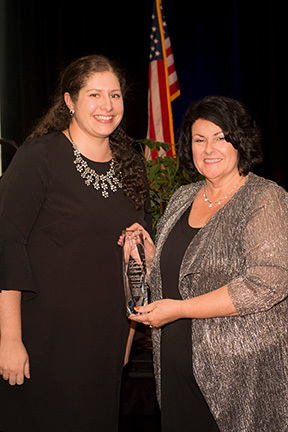 The Emerging Leadership Award was developed in order to recognize the next generation of credit union leaders in Indiana for their accomplishments and for their potential to be an Indiana credit union leader in the future. Combs was honored October 12 during the Chairman’s Awards Banquet, a special event during the Indiana Credit Union League’s annual convention. Danielle Combs of Crane CU (left) accepts her award from League Chairman Karla Salisbury of KEMBA Credit Union. The Indiana Credit Union League is the statewide trade association for credit unions in Indiana. Those credit unions serve more than 2 million Hoosiers.